You learn something new every day. Before I went to Charango Barbacoa, I assumed it was a fancy name for Spanish braai food. I quickly learned that the origin of the word ‘barbecue’ is derived from the Caribbean word ‘barbacoa’. And a barbacoa was a structure made of wood used by Taino Indians to smoke their food, not cook it. Armed with my new knowledge and understanding of the food I was about to encounter, I was eager to give it a try. 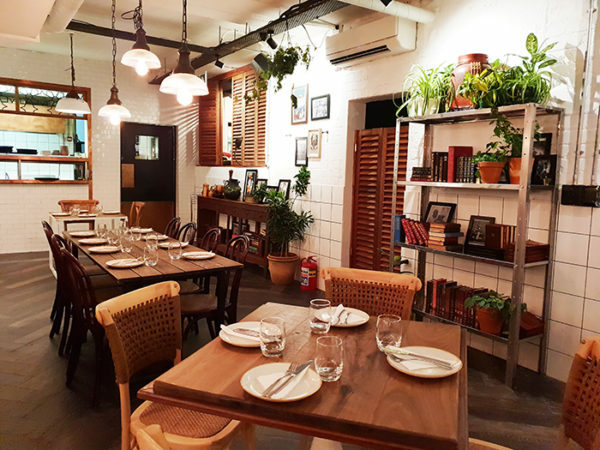 Charango Barbecoe is not new to Bree Street, but Charango Barbacoa is. The change is subtle, a difference between an ‘a’ and an ‘e’. But that’s just the beginning. 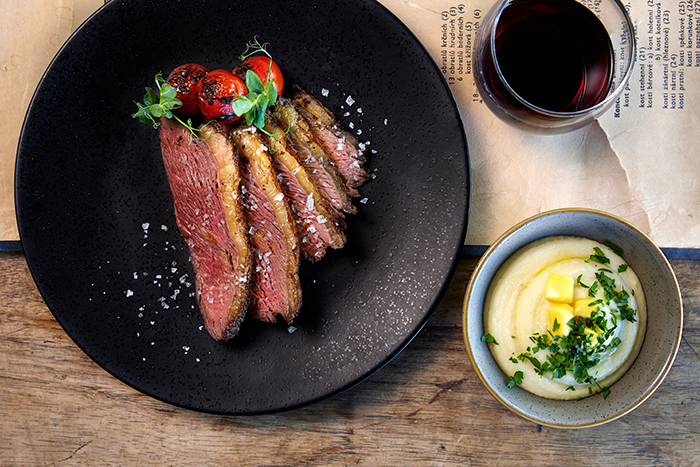 The menu has been reinvented, and now celebrates South American flavours – smoked and grilled, it’s the best way to enjoy a piece of steak. For starters, you can choose between seared tuna tataki, ceviche, chipotle chicken livers or prawns. 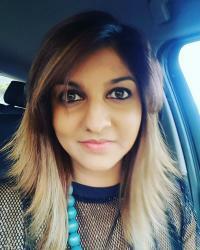 The prices range from R80 – R135. 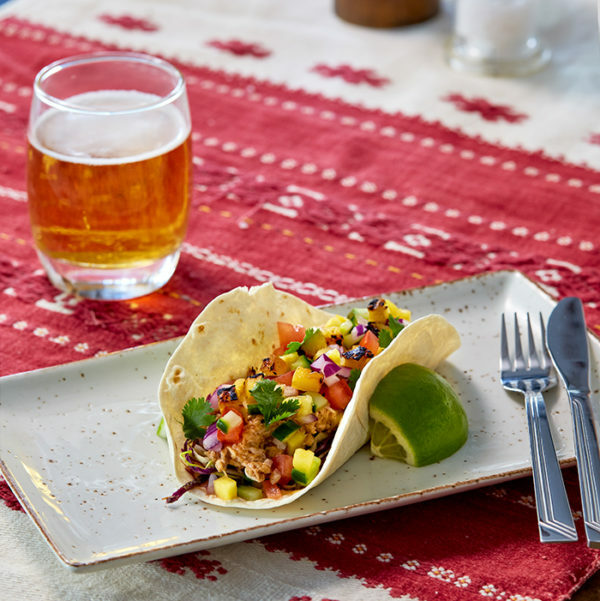 Alternatively, you can try out their tacos, pulled pork, dirt-rubbed tuna or signature meat. According to our waiter, the signature meat taco is the one to try. And he would be spot-on. The meat is smokey and succulent, encased in a warm soft taco shell. Choosing a main meal is an authentic experience in itself. Cuts of meats are displayed on a chalkboard, and you add the rub, the sides and the sauce. If you enjoy experimenting with unconventional flavours, this is definitely for you. Wet meat rubs include salsa verde, chimichurri, coriander pistou, chermoula, salsa pilon, red pesto and basil pesto – each a different flavour profile. I see lamb ribs on the board and I am curious about the preparation; it is not often that you find this option at a restaurant. 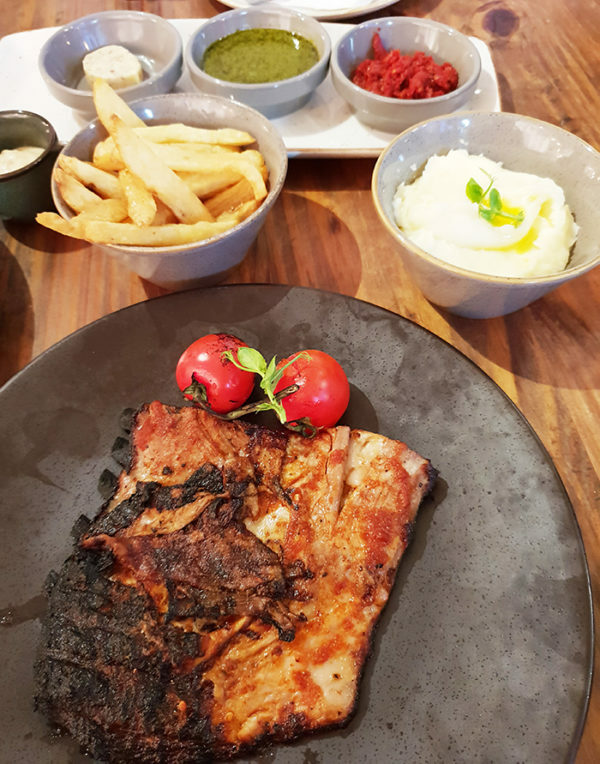 Lamb ribs, chimichurri wet rub, mashed potatoes and a bone marrow butter – order placed. The lambs ribs were succulent and the mash creamy. I walk around to gauge the aesthetic and it’s interesting. The bar is reminiscent of somewhere exotic; I am half expecting salsa dancers to sashay through any minute. The restaurant is spacious and spills out onto the sidewalk. There is a definite theme of comfort meets South America. Shelves are populated with hanging plants and lights bath the interior in soft tones. I love that it’s not pretentious and is clearly not trying to be. The interior is bathed in soft light. The lamb ribs arrive and they are fall-off-the-bone succulent, the only way they should ever be prepared. The wet rub is not too apparent but the mash is present and divine. A silky mash is a difficult ask in a restaurant. As easy as it seems to get right, it is something only a few ever pull off successfully. The bone marrow butter is a rich addition to the meal. Dessert options include deep-fried ice cream and creme Catalina (if you’re in the mood for something light with berries). 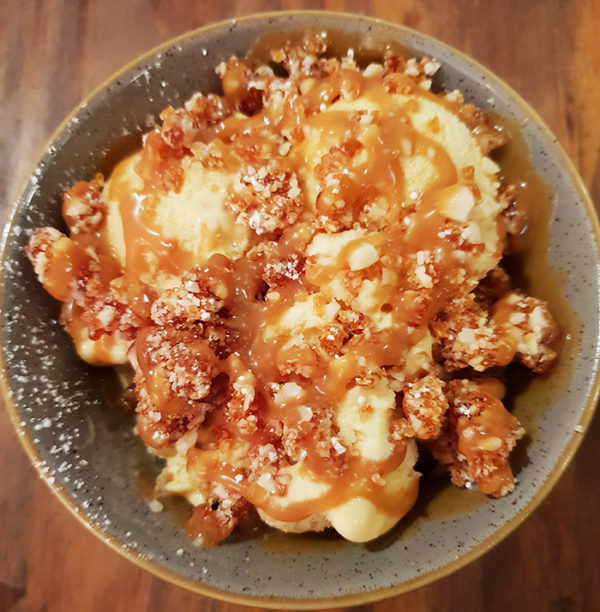 There is only one dessert to order – the dulce de leche ice cream, topped with crushed candied almonds and pisco-infused dulce de leche sauce. It is soft, crunchy, creamy, cold, and a delicious mouthful. The dulce de leche ice cream. The food experience here is definitely unique and so are the flavours. Pop in and check it out if you’re looking for a place to embrace other food cultures from around the world.